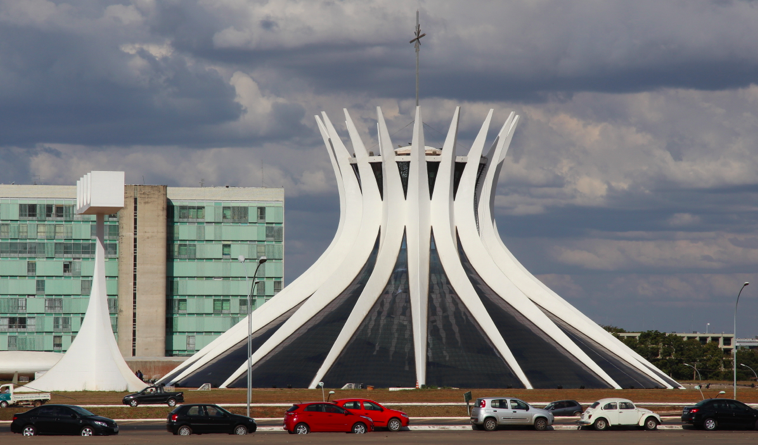 Gobsmacked by the cathedral in Brasilia | Where to next? 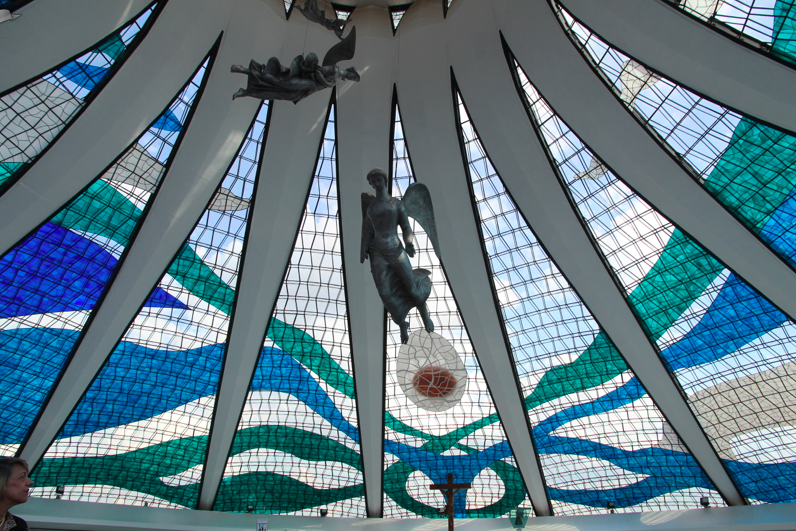 Brasilia’s Catedral Metropolitana sneaks up on you and hits you between the eyes. From the outside, the hyperboloid building, which was designed by Oscar Niemeyer, seems to be just a black and white structure—16 brilliant white, flared concrete columns, that weigh in at 90 tons each, interspersed with acres of black fibreglass. Near the entrance are four bronze statues of the evangelists, Matthew, Mark Luke and John (each with his own pigeon or two when we were there). Sculpted in 1968, these three-metre artworks are the work of Dante Croce. Also out the front is a bell tower with four large bells donated by Spanish residents of Brazil. All in all, it looks impressive but with no particular wow factor. Then you enter the dark tunnel that leads into the cathedral and you begin to realise how gobsmackingly beautiful and clever it all is. What you see from the outside is merely the cathedral’s roof. Within there is a vast space flooded with light and capped with a 360-degree, suspended ceiling of stained glass in blues, greens, white, browns and glimpses of the actual sky. Poor John and I (wearing our shorts like everyone else) sat in one of the back pews for a long time just admiring and trying to take in the design, colours, sky and space. Marianne Peretti created this 2000-square metres of ‘heaven’ in 1990, and all pieces were handmade. 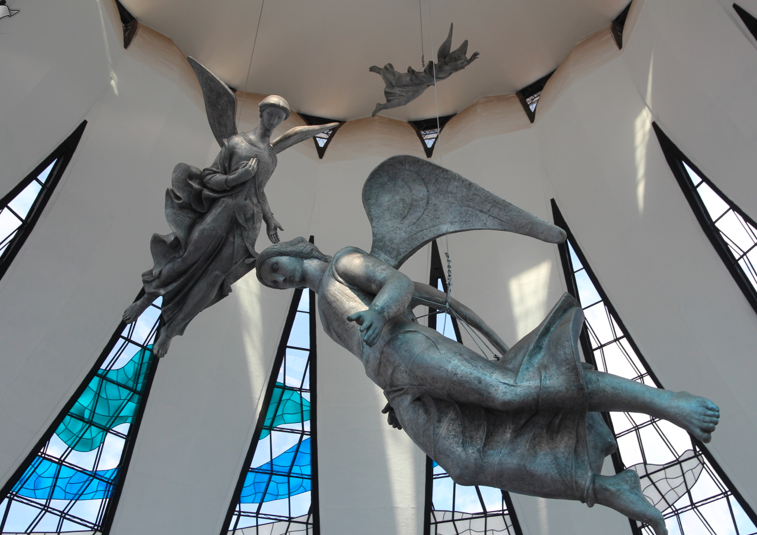 Three metal angels hang from the centre of ceiling. Designed in 1970 by Alfredo Ceschiatti, in the collaboration with Dante Croce, the angels range in length and weight from 2.2 to 4.2 metres and 100 to 300 kilograms. The cornerstone was laid in 1958, but once the presidential term of Juscelino Kubitschek (who spearheaded the development of the new capital) ended, the push to finish many structures in Brasilia stalled. It seems Kubitschek wanted the cathedral to be ecumenical, and to be paid for by the state and open to all faiths. But future governments did not provide funding, and the building was eventually turned over to the Catholic Church to complete. The cathedral was consecrated in 1968 (still with no roof), and officially opened in 1970. 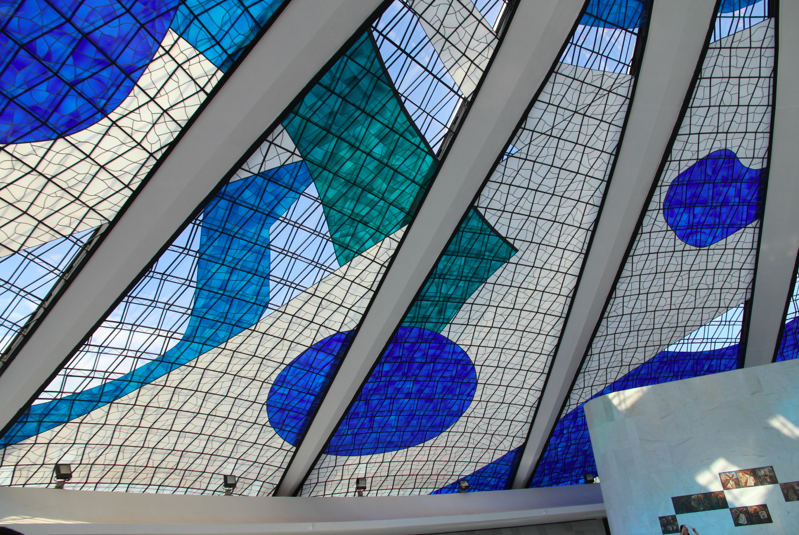 The cathedral, which is also known as the Metropolitan Cathedral of Our Lady Aparecida, was extensively renovated over the last year, with work being done on the roof, stained glass, marble surfaces, angels, concrete and bell mechanisms. P.S. We only had an afternoon in Brasilia, and Poor John and I already knew that the inner city of this created capital was well worth seeing. So we left the truck before it got to the hostel and hopped in a taxi so we could race into town and see as much as possible. As it turned out, we were the only people from the whole group who made it to the cathedral. How lucky we feel. G’day and WOW , true! Oh yeah, we were well and truly gobsmacked, and there’s more to come. Simply a Bee-U-Tee-Full Cathedral… nice photos and nice that the nuns did not notice that you were wearing shorts! I know. I still can’t get over how beautiful it is. You’re right. The work is completely wonderful. Fantastic! I think I’d avoid a pew under all that suspended metal, for fear an “angel” might descend and “take me to Heaven”! A spectacular building, and thanks for sharing both exterior and interiors of it. Good point. Fortunately there aren’t any pews under the angels, so I guess no one has to be panicky about the possibility of them ‘descending’. I like the cathedral’s stained glass and allowing the natural outdoor sky lighting to be seen, shines through and varies depending on the weather outside and time of day. And I am sure that G-D is looking in at people praying to see who is doing a good job and who are bad by looking at their cell phone LCD screens reading text messages and replying. I loved the fact we could see the sky through the stained glass—means every view, every day, is different. Thank you for this post. These three churches are indeed gorgeous, but on our countryside, there are more beautiful churches. These churches present big churches, but on our countryside there old wooden churches which offer amazing art for example. After photographing in Finland about 440 churches, I can make my opinion. Maybe these few examples open eyes that outside Helsinki there are real “gems”. Welcome someday to travel outside Helsinki and explore what “real” Finland offers. There You can dance old Finnish dances on Saturday, buy Finnish products, visit Saunas and maybe to meet Santa. Penedo is awesome. Oh my, thank you for this information and the link. I hadn’t heard of Penedo, but I will certainly visit if I return to Brazil. Feeling blue? Visit the Dom Bosco Sanctuary | Where to next? Enjoying three very different churches in Helsinki | Where to next?